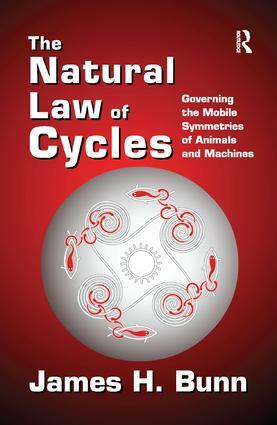 The Natural Law of Cycles assembles scientific work from different disciplines to show how research on angular momentum and rotational symmetry can be used to develop a law of energy cycles as a local and global influence. Angular momentum regulates small-scale rotational cycles such as the swimming of fish in water, the running of animals on land, and the flight of birds in air. Also, it regulates large-scale rotation cycles such as global currents of wind and water.James H. Bunn introduces concepts of symmetry, balance, and angular momentum, showing how together they shape the mobile symmetries of animals. Chapter 1 studies the configurations of animals as they move in a head-first direction. Chapter 2 shows how sea animals follow currents and tides generated by the rotational cycles of the earth. In chapter 3, Bunn explores the biomechanical pace of walking as a partial cycle of rotating limbs. On a large scale, angular momentum governs balanced shifts in plate tectonics.Chapter 4 begins with an examination of rotational wind patterns in terms of the counter-balancing forces of angular momentum. The author shows how these winds augment the flights of birds during migrations. A final chapter centres on the conservation of energy as the most basic principle of science. Bunn argues that in the nineteenth century the unity of nature was seen in the emergent concept of energy, not matter, as the source of power, including the movements of animals and machines. In each chapter Bunn features environmental writers who celebrate mobile symmetries. This book will interest students, naturalists, and advocates of the environmental movement.